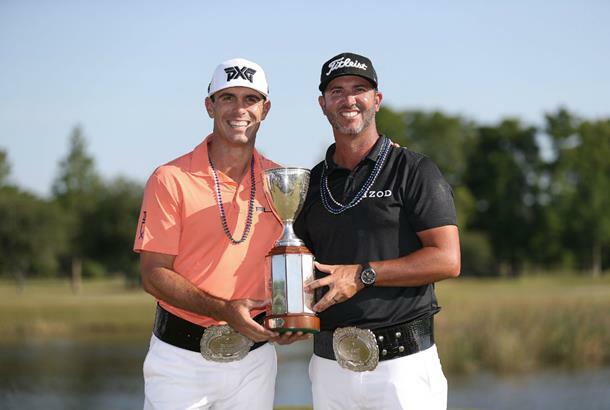 Billy Horschel and Scott Piercy signed off with a par on the par-five 18th to finish the tournament at TPC Lousiana on 22-under-par, guaranteeing a one-shot victory over playing partners Jason Dufner and Pat Perez. For Horschel it was a return to the scene of his first PGA Tour victory in 2013, when the event was individual stroke play, but this time, it was Piercy who holed the winning putt. Though not before it rattled around the hole before dropping to the bottom of the cup. "The last putt ... it just wanted to take a little trip around the hole once or twice to soak it in," Horschel said after their victory. It was certainly Horschel who holed the larger share of putts between the pair over the week, but Piercy said his partner's confidence rubbed off on him despite it being a part of his game he's recently struggled with. "He really picked me up this week with the putter," Piercy said. "Seeing his ball go in the hole time after time, it gave me sort of an inner fire to want to do the same thing because I haven't been doing that this year. "It's kind of weird, because I don't feel like I played very well at all. But him doing what he did, I just kind of helped a little bit here and there. His energy also gave me a boost for sure." 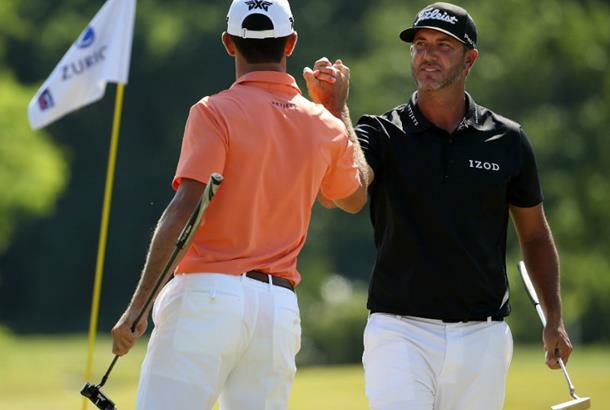 A fifth PGA Tour victory for Horschel and fourth for Piercy looked to be in their sights after opening their final round of foursomes with back-to-back birdies to get to within one shot of the overnight leaders. Another gain at the par-five 7th hole saw them make the turn in 33, before they carded another pair of successive birdies at the 10th and 11th holes to get to 22-under. From there, pars on the final seven holes was more than enough to claim victory. President's Cup partners Charl Schwartzel and Louis Oosthuizen finished in third two shots adrift, while a chip-in eagle from Chris Paisley saw himself and compatriot Tommy Fleetwood share fourth spot with Brice Garnett and Chesson Hadley. Garnett and Hadley had a good run at the title and briefly held the lead before posting three bogeys in their final five holes to drop out of contention. Masters champion Patrick Reed and playing partner Patrick Cantlay finished in the group of teams five strokes back, with Scottish pair Martin Laird and Russell Knox also on 17 under. Ryder Cup team-mates Henrik Stenson and Justin Rose briefly threatened the lead before posting four bogeys in a five-hole stretch on their way to a final-round 73.